Having had a chance to catchup and reflect a bit on our IraqTech trip last week, I wanted to share a few more thoughts and also address a few questions that have come in. We traveled in a secure manner and met with many leaders and students all over the city. It was obviously a small slice of the city that we covered over the course of 4+ days. Having said that, the parts of Baghdad we saw beyond the International Zone, neighborhoods not far from places like Sadar City – were remarkable. We got an on the ground view ( and an amazing helicopter ride ) where we saw a ton of active shops, cafes which were crowded, shauma stands with long lines, and traffic that was significant on the major roads. Many people who once worked and lived on secure compounds told us how they have now moved back to living in residential neighborhoods. In addition many had sent their families to live in Jordan or Kuwait, and were now working on bringing the families back to Iraq. With all that said, violence is still ongoing and people are mindful of which neighborhoods they visit and take other precautions. But everyone universally felt that the security environment had improved dramatically. I had heard over the years that it was getting difficult to attract people to Iraq and that NGOs were pulling out, especially after the UN bombing back in 2003. What I found during my trip was quite the opposite, and the people we interacted with were absolutely A-list people — some of the brightest and most accomplished people that I had ever met. Not only were they extraordinary, but they also worked 24/7 – including the weekends. These are people who could be working for top companies back in the U.S., but instead were away from their families and doing really important work. My hope is that I get to work with them again in some capacity in the future. In meetings with GOI (Government of Iraq) officials, this was a very big theme as the drop in price is having a real impact on budgets for the coming years. I felt like many of these officials were channeling Tom Friedman at times, who often talks about how the relationship between oil prices and private investment / pace of innovations are inversely related. Many spoke about needing private sector activity to offset the declining oil revenues. I saw two immediate ways that WordPress could help. 1) Private sector. Iraq has tens of thousands of highly educated computer science and computer engineering students with very few commercial opportunities. Most of these students will end up in government roles and not in any kind of private firms. My recommendation to them was to have students get involved with Open Source projects like WordPress, MySQL, PHP, etc — start making a name for themselves, contribute to these projects, work on translations,etc — and get some recognition. Blogging about it doesn’t hurt either :). Once Iraqis start getting involved and becoming experts, they can start bidding on all the available projects that are listed in marketplaces like oDesk. There are thousands of paid projects today that are looking for contractors and where the location of the contractor is not important. There is no reason today that only contractors in India and eastern Europe dominate these marketplaces and not ones from countries like Iraq. 2) Transparency and authentic voices. With tools like WordPress and our other projects like BuddyPress I saw an immediate platform for students, gov’t officials, companies, and really anyone working on interesting things to get the word out and put a face to the new Iraqi society. I heard lots of complaints from various people in Iraq that the media only covered bombings and had a “if it bleeds it leads” mentality. While somewhat true — and to me that’s more about news consumption habits than news producing — the best way to counter that perception is to produce your own content. Unfortunately, at least up until now, Iraqis, an the Arab world at large, is not producing much of it’s own content relative to other parts of the world. As my friend on this trip Ahmad (from Google) often pointed out, less than 1% of the Google index is in Arabic. We had an amazing security detail. I can’t, and won’t, reveal many details on how exactly they protected us, but I never felt in danger and had 100% confidence in our team. I’ll also say one thing: There is something remarkable about the quality of security and military personnel that are produced by free and open societies. These men and women are not only highly trained and have a ton of experience in hostile environments. They also care deeply about their mission, they are highly educated and understand the geopolitical importance of the work being done, and they exhibit a level of professionalism that is unmatched. Anyone thinking of going on a trip like this should feel confident about the security being provided. – Heard the word “transitioning” in every meetings — as in “Iraq is transitioning” to the next phase. People had a real sense that they were living through big historical times. – People spoke of the sanctions of the 90s on the same level, from a negative impact perspective, as the first gulf war and the war in 2003. This was especially true at the Universities where many labs had to be shut down since the “dual use” of these labs was in question. partially in the dark. The Iraqis in the meeting didn’t miss a beat and just kept talking. Clearly this happens pretty often. Lots of people asked me about this. The person who put this all together is Jared Cohen who works for Hillary Clinton at the State Department. He’s a really remarkable guy with a ridiculous variety of skills and keen insights about the middle east. Smart, easy-going, and relatively young – you may have read about him in the New Yorker back in 2007, or seen him more recently on the Colbert Report. He is also the author of a recent book everyone should check out: Children of Jihad. Huge thanks to Jared for putting this all together — it was a real honor and privilege to be part of this delegation. Beyond chronicling day 1, day 2, day 3, and day 4 of this trip — I’ll continue to post updates here as our group progresses and announces some initiatives from our trip. While a big component of the trip was fact finding and a bit of a listening tour, we have some real concrete ideas about ways in which we can engage with various Iraqi stakeholders — stay tuned ! – Ahmad took a ton of photos and blogged daily. – Over reliance on looking for jobs in the gov’t vs private sector. – Professors and Deans acknowledged that Iraqi gov’t won’t be able to hire 30-40% of these students. – A near total disconnect between recent grads, alumni and the actual university. In Iraq there is a ministry for nearly everything, and the faculty of the University admitted that jobs were “not our duty” since a ministry of labor employment ( I believe ) is in charge of that. – The University of Baghdad has about 80,000 undergrad students, and the incoming freshman class is around 12,000. – Lots of chatter about how the sanctions in the 90s really impacted the various technology labs of these schools – forcing many of them to shut down. – Huge brain-drain post 2003 of smart post-doc students to neighboring countries and Western countries. – Faculty admits that students today are told what to study based on their secondary school scores, and not based on their interests. 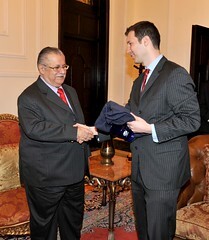 – Meeting with President Talabani was pretty interesting. He lives in the former palace of Sadaam’s First Lady. As in most of our meetings we had traditional coffee and tea. – As we were leaving the meeting with Talabani, he was set to meet with Bashar Al-Asad of Syria. Just finished my first day of a really interesting trip to Baghdad, Iraq. I’m here as part of a delegation with the State Department, and will have lots more to say in a few days. The trip into Baghdad alone so far has been quite amazing — and not surprisingly the US Military, State Department, and all others involved have been super impressive. I have run across Andrew Olmsted’s blog posts from time to time, and was deeply saddened to see that he lost his life today in Iraq. This is an entry I would have preferred not to have published, but there are limits to what we can control in life, and apparently I have passed one of those limits. And so, like G’Kar, I must say here what I would much prefer to say in person. I want to thank hilzoy for putting it up for me. It’s not easy asking anyone to do something for you in the event of your death, and it is a testament to her quality that she didn’t hesitate to accept the charge. As with many bloggers, I have a disgustingly large ego, and so I just couldn’t bear the thought of not being able to have the last word if the need arose.